In celebration of the Map Table (that ended up being my Creating with the Stars demise.... not bitter), I decided to gather together my top 5 favorite do-it-yourself coffee tables. Most of these ideas are under $10! That is ten dollars people. In the grand scheme of furnishing living rooms, a coffee table is probably one of the cheapest items in there and certainly something you can find 2nd-hand (or free). This makes it the perfect item to experiment on; get punchy, add that pop of color, experiment with patterns. After all, if you screw it up, it was pretty cheap to begin with and you don't have much to lose. Also, coffee tables are usually small. So even if you get really crazy with it (maybe neon pink?) 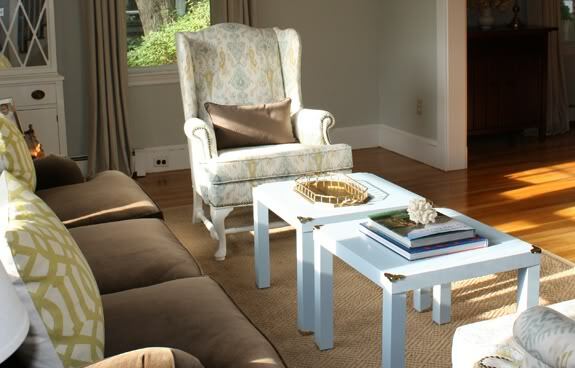 it's still only a small pop of color in your much larger room. If I had less self control, we'd have 5 coffee tables by now. I want to do all of these. Here are my 5 favorites. This table is from Kyle Not Really a Dude. Ha, funny name. Don't think she keeps up with the blog anymore but the table is cool and started out as a $10 Goodwill find. Love that. I want one of these in the play room! This would be fun at parties or a game night too. 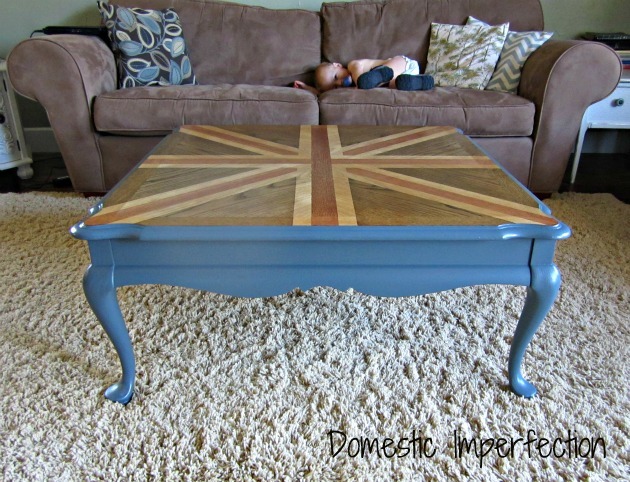 This Union Jack coffee table is from Ashley at Domestic Imperfection. Not only did she (and her hubs) paint the legs, but they achieved the Union Jack look on the top with stain. Such a great look and conversation piece in a living room. And, of course the best part, they got the table for free, used leftover supplies, AND completed the project while their baby napped. You know I love that. :) Full tutorial as well. 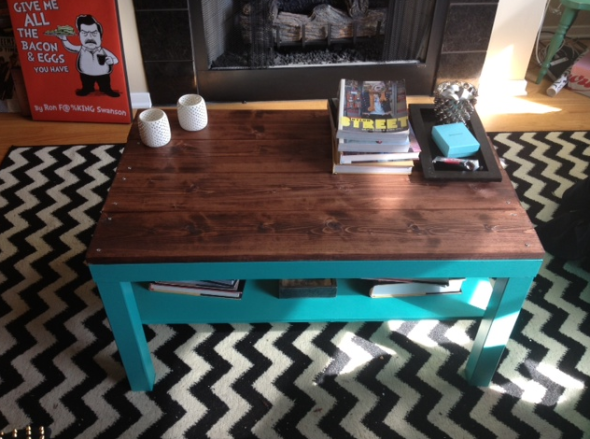 This tree stump "coffee table" is from Alicia at Thrifty & Chic. This is a great "outside the box" idea. First of all, tree stumps are everywhere right now... very hot. And, you can ALWAYS get them for free. I think every time I've ever visited the free section of Craig's List, someone is begging for anyone to come pick up a fallen tree. If you're not into stumps, a grouping of those small garden stools would be really cool too. 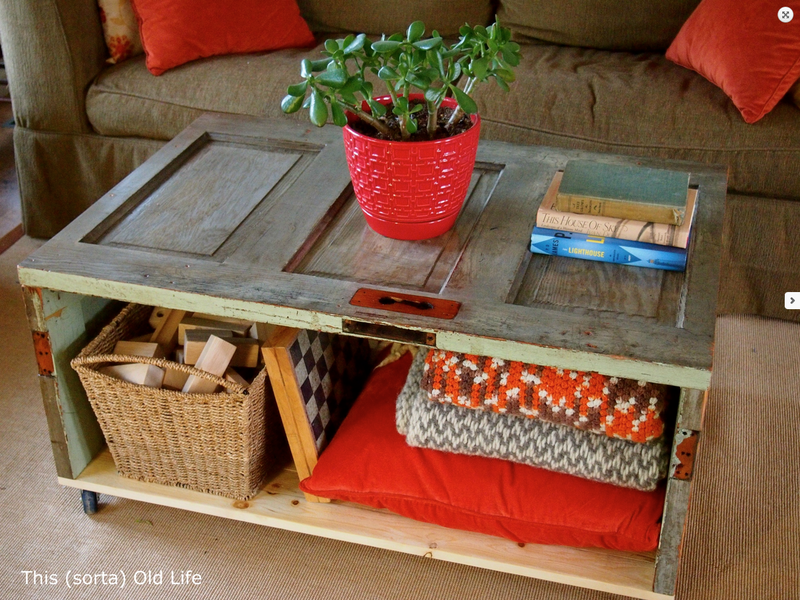 If you can't find a hand-me-down, Goodwill find, or dumpster rescue coffee table, hack something from IKEA. Those suckers, while inexpensive, are kinda plain. A blank canvas if you will. There are so many possibilities. This one is from Rose Gold Walls. The teal and stained wood combo gets me. Nice! And this from See What I Sea Designs. You know I'm a fan of a table wrapped in rope! One last one. 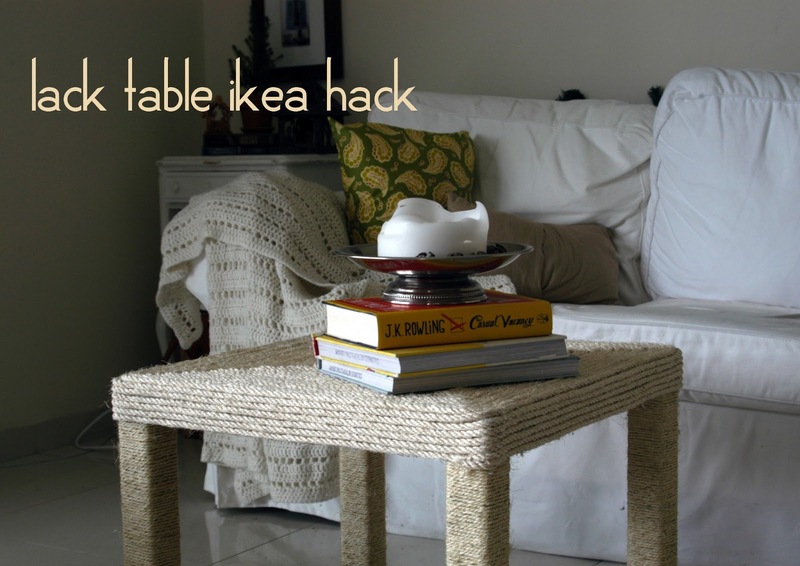 Super easy campaign style IKEA hack here from Jenny at Little Green Notebook. This is a really quick (and mess-free) way to add some detail to a plain old table (or pair of tables). Great detail for very little money. So give a dumpster dive some lovin'! 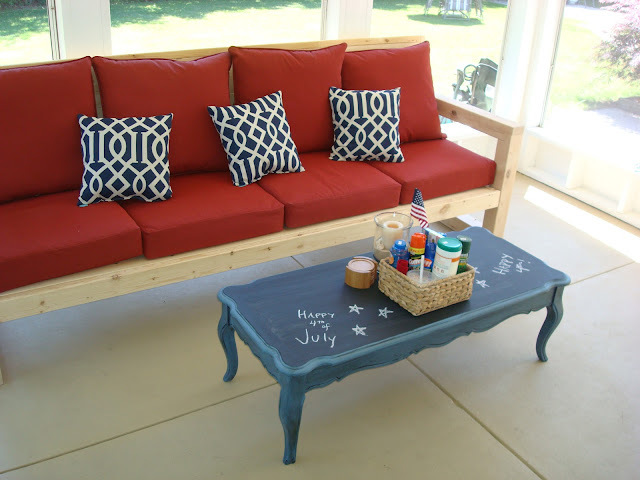 And, let me know if you have any DIY coffee table favorites floating around out there. I'd love to see them! Welcome... your table is great! I'm going to poke around your blog now. :) The mosaic map sounds cool! Thanks so much for featuring my little rope table! This is a great collection! We just moved back to the States and I'm going to need to refurnish our new abode so I love seeing all of the ideas! I really love to use old wine crates for home decor. They are so useful for making something which you really love. I have a diy project that show how to make coffee table with wine crates. I invite you to visit my blog. Hope you like.